CHICAGO--(BUSINESS WIRE)-- Hyatt Hotels Corporation (NYSE: H) announced today the opening of Hyatt Regency Amsterdam, the first Hyatt Regency hotel to open in The Netherlands’ dynamic capital city. Hyatt Regency Amsterdam is the third Hyatt-branded hotel in The Netherlands, joining luxury lifestyle hotel Andaz Amsterdam Prinsengracht and select service hotel Hyatt Place Amsterdam Airport. 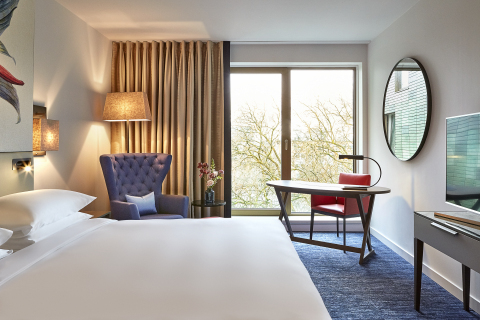 Located in the center of Amsterdam, bordering the energizing East district and right at the heart of Plantage Amsterdam, Hyatt Regency Amsterdam is designed to connect business and leisure travelers to all Amsterdam has to offer. The hotel is nearby some of the city’s best museums, shopping and dining – with easy access to the city’s Metro trains and tram lines, guests can enjoy top sites including Rijksmuseum, Dam Square and Canal Ring. Additionally, the hotel is located less than 10 minutes from Amsterdam RAI Exhibition and Convention Center, and 20 minutes from Amsterdam Airport Schiphol. Hyatt Regency Amsterdam has been thoughtfully designed, blending history with a modern-day 24/7 lifestyle. The hotel’s 211 guestrooms, including 15 suites, range in size from 322 square feet (30 square meters) for a standard room to 1,356 square feet (126 square meters) for the Spinoza Suite. Inspired by the invigorating greenery of the hotel’s surroundings that is home to leafy boulevards, the city’s botanical garden and ARTIS Amsterdam Royal Zoo, each guestroom is elegantly decorated with blooming floral and botanical artwork. Flexible furnishings, a generous workspace, large windows, and a striking bathroom with soothing walk-in rain shower complete the guest experience. Seamlessly flowing out of the lobby, on-site restaurant and bar Mama Makan is the vibrant heart of the hotel’s drinking and dining experience. Evoking the atmosphere of a grand café inspired by the dining and sitting rooms of Jakarta, head chef Paul Verheul and his team take guests and locals on an enticing culinary journey. Bringing together authentic and bold aromas and tastes, Mama Makan is a fusion of traditional Dutch café fare and Indonesian specialties that make a great start or end to the day. The bar is an extension of this captivating space, mixing up daring cocktails inspired by well-travelled spices, herbs and plants. This is also the place for a freshly brewed Javanese-style coffee or an ice-cold drink. When weather permits, the Mama Makan experience will be extended to the hotel terrace, where food and drinks can be enjoyed with the Dutch summer breeze. The hotel’s 24-hour café-style market offers one-stop experience for guests to eat and drink whenever and wherever they would like. The market provides a wide selection of refreshing beverages along with delicious homemade pastries and bakery items. Boosting more than 5,565 square feet (517 square meters) of flexible meeting and event facilities, Hyatt Regency Amsterdam provides cleverly designed spaces with abundant natural daylight and top-of-the-line audiovisual equipment that can cater all occasions – meetings to conferences, weddings to social events. The hotel’s main event venue is the 2,055-square-foot (191-square-meter) ballroom with eye catching oak wood flooring and floor-to-ceiling windows that overlook the Singelgracht canal. The ballroom is accessible by a separate entrance and is unrivalled in versatility – from seminars to weddings and festive gala dinners, the modern design of the room offers endless opportunities for customizable layouts. The inviting, adjacent foyer is ideal for coffee breaks, breakout sessions or to lounge and connect with others. For smaller groups, Hyatt Regency Amsterdam offers three individual event rooms that can be used individually or can be connected. Sophisticated by design, these meeting rooms provide ample space and flexibility for engaging meetings of any sort. Hyatt Regency Amsterdam provides guests with various options to refresh and re-energize, including a 24-hour fully equipped fitness center and sauna. Additionally, guests can enjoy a variety of nearby jogging trails for a run through the city or the nearby Oosterpark. For more information, please visit amsterdam.regency.hyatt.com. The Hyatt Regency brand prides itself on connecting travelers to who and what matters most to them. More than 175 conveniently located Hyatt Regency urban and resort locations in over 30 countries around the world serve as the go-to gathering space for every occasion – from efficient business meetings to memorable family vacations. The brand offers a one-stop experience that puts everything guests need right at their fingertips. Hyatt Regency hotels and resorts offer a full range of services and amenities, including the space to work, engage or relax; notable culinary experiences; technology-enabled ways to collaborate; and expert event planners who can take care of every detail. For more information, please visit hyattregency.com. Follow @HyattRegency on Facebook, Twitter and Instagram, and tag photos with #AtHyattRegency.